Bilge Ebiri has a beautiful and insightful interpretation of Terrence Malick's To the Wonder. I caught the movie at the Toronto Film Festival last September and enjoyed it. Many have criticized To the Wonder as being slight in scope as compared to The Tree of Life, but one could have said that about just about any movie that came after a movie that sought to understand the meaning of life and the universe. That criticism feels simply like a matter of sequencing. When I first saw To the Wonder, it seemed clear that Malick had gone further in this direction. The movie unfolded more like a piece of music than anything else, rhythmic and fluid and concerned more with the emotional valence of a given scene rather than its narrative value. The second time I saw the film, however, I was floored. Yes, Malick had furthered his approach, but I hadn’t realized to what extent. And I think that herein lies the key to the film. To the Wonder has not opened yet, but watch the trailer. Observe the choreography of movement of camera and human bodies just in select shots and you'll understand what Ebiri means. The Tree of Life stayed with me longer, but To the Wonder was rapturous in its own way. Ebiri's discussion of movie and dance spurred a memory of another movie where music and image came together, for just a scene, as dance. Given how rarely movies attempt to become a dance (I'm excluding movies that are explicitly musicals here), I wanted to revisit that movie and that scene. The movie I'm speaking of is Birth, directed by Jonathan Glazer and starring Nicole Kidman as Anna, a recent widow when the movie begins. The scene in question is early in the movie, beginning at 7:37, and it's set to the musical track titled Engagement, composed by Alexandre Desplat in one of his finest scores. The track is so named because it plays under the scene of Anna's engagement party. She has decided to marry her boyfriend Joseph after a long period of mourning her ex-husband Sean who died of a heart attack. This track by Desplat is a waltz, and if you watch the action on screen carefully, you'll see it's actually choreographed as a waltz. The first character who "dances" on screen is Clifford (Peter Stormare), Sean's brother, at 7:45 to 7:47. He is walking one direction, and then he spins the other way in a pirouette. You can see a few frames of this move below. Next we cut in between shots of Clifford's wife Clara (Anne Heche) running to the party and Anna (Nicole Kidman) at the party, greeting guests. Anna's flowing movement through the crowd is a dance of its own, as she leans in to greet guests to one side and the other. You can tell Glazer has choreographed the movement of this entire scene carefully because just a few shots later, at 9:11, Glazer cuts suddenly from a shot facing Clara's left side to a shot facing her from the direct opposite side. Not only does he cross the line completely, the shot facing her from the right is framed more tightly. It's disorienting, like being twirled around suddenly by your dance partner. Crossing the line is rare in movies because it ruins the illusion of visual continuity. So when it happens in a movie, it's almost always meant to draw your attention or to signify some significant thematic or plot shift. If you watch Birth, you'll understand why Clara might be bewildered and disoriented in this scene given what she has just done before she runs into this building. She has just made an important decision, having decided at the last minute to discard her original engagement present for anna, and now she needs to purchase a replacement. But jumping the line also serves another purpose here: it sets up another elegant bit of choreography. Holding on Heche from the right side for just a beat, Glazer then immediately executes a seamless pirouette that starts with Anne Heche turning her head to the left and finishes after a cut with Kidman's head framed at the same size, completing the 180-degree turn to the left. 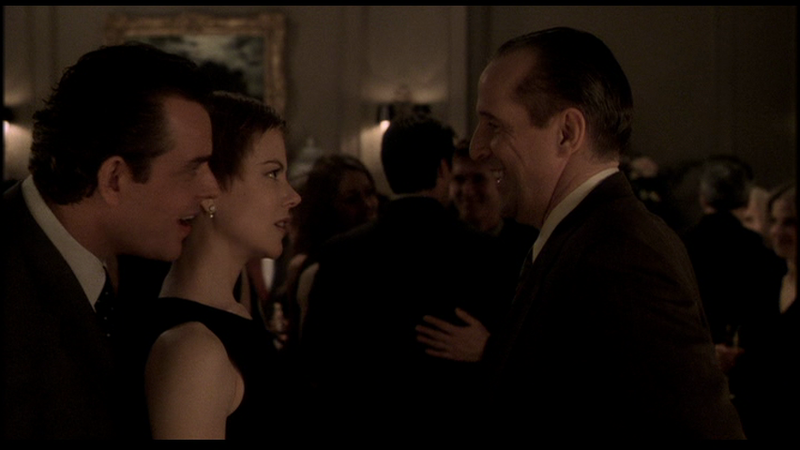 Kidman continues through the room, greeting one guest after the other, some to her right, some to her left, stopping for just a moment with each person until she encounters Peter Stormare. It's as if it's a group dance and Kidman is moving through the room until she reaches her next dance partner. As Anna speaks to Clifford, her boyfriend and now fiancé Joseph comes up to her from behind and leans over her right shoulder, causing Anna to do a quick spin back and forth by Anna between the two men. Clifford congratulates them and then leaves, and the waltz ends as Anna turns to Joseph and kisses him. She's finally ended up with her last dance partner of the evening, and the musical track tapers off as the waltz concludes. In most movies, the movie is shot and edited before the music is composed, but whether this scene was cut before Desplat wrote the track or not, it's clear the interplay between the movement of characters and the music was deliberate. Birth left me a bit cold the first time I saw it, but over the years it's grown on me. The craft of the scene I dissected above, with its tight and perfect melding of music, camera movement, actor movement, and theme, helped it to stay lodged in my memory. As a study of human love and grief and the lengths to which it can give our belief a dangerous clarity, Birth is operatic in scope. The grand thematic range of the movie itself is signaled in the opening scene of the movie by Desplat's track Prologue. It begins with with a flute oscillating between high and low notes, and that is soon followed by a triangle chiming a similar high-low gap. This is followed by the introduction of the grand and sweeping romantic theme by the horns and strings. Like the prelude to an opera, Desplat's Prologue cues us, before we've even understood what the story is, that we're about to see a movie that bounces rapidly between the highest of highs and the lowest of lows. What is opera about if not melodrama, the stormy interplay of death and reincarnation, hope and sorrow, love and grief?